Marvel has been making sure fans know who the members of Team Cap and Team Iron Man are in Captain America: Civil War. A few days ago we got two different sets of character posters, and yesterday, the studio debuted two brief trailer previews featuring each team. These previews didn't feature any footage from this upcoming movie, but it did announce that the second full trailer will debut today. 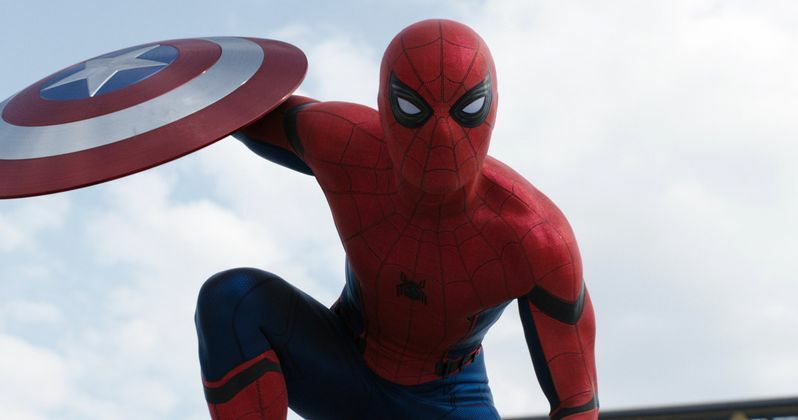 Now the full trailer is finally here, giving us our very first look at the new Spider-Man (Tom Holland). The first trailer for Captain America: Civil War was released back in November, and fans also got to see new footage from this Phase Three adventure with the Super Bowl commercial last month. But everyone has been waiting with bated breath for teh next trailer, especially since there is one major character making his MCU debut in the movie who hasn't been seen yet, Tom Holland's Spider-Man. It wasn't known if we'd get our first glimpse of this iconic Marvel character in this new trailer, or if we'd have to wait until the theatrical release on May 6 to see him for the first time. But all those rumors that we'd see the web-slinger prominently featured in this latest sneak peek was thankfully true! Team Iron Man includes Tony Stark (Robert Downey Jr.), Black Widow (Scarlett Johansson), Vision (Paul Bettany), War Machine (Don Cheadle) and the new character T'challa (Chadwick Boseman), who will make his debut in this movie before starring in Black Panther, set for release on February 16, 2018. Marvel's Captain America: Civil War also stars Frank Grillo as Crossbones, William Hurt as Thaddeus Ross and Daniel Brühl as the villainous Baron Zemo. Captain America: Civil War will kick off the Marvel Phase Three slate, which is jam-packed with 10 highly-anticipated movies. Following Captain America: Civil War is Doctor Strange, which is currently in production and set for release on November 4, 2016. Guardians of the Galaxy Vol. 2 is also in production, arriving in theaters on May 5, 2017, followed by Thor: Ragnarok on November 3, 2017. Black Panther hits theaters on February 16, 2018, followed by Avengers: Infinity War Part I on May 3, 2018 and Ant-Man and the Wasp on July 6, 2018. Rounding out this Phase is Captain Marvel (March 8, 2019), Avengers: Infinity War - Part II (May 3, 2019) and Inhumans (July 12, 2019). Take a look at the full trailer for Captain America: Civil War, and stay tuned for more as we get closer to the May 6 release date.